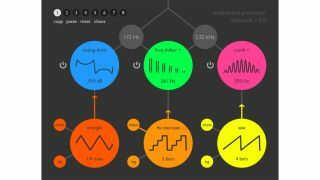 Molecule has a similar look to that of Sinevibes' Atom plugin. The latest plugin to roll off the Sinevibes Mac Audio Units production line is Molecule, a multi-band processor that enables you to split your sound into three frequency bands - low, mid and high - and then process each of these with different effects. The list of included processors features the likes of comb filter, chorus ensemble and frequency shifter, as well as barber-pole phaser, circuit-bent filter and digital- and analogue-style distortion. Each band is also equipped with its own tempo-synchronised modulator with multiple waveforms and realtime randomisation. Molecule lets you store up to eight complete snapshots of itself and switch between them in realtime or via host automation. The interface is striking, too, with your "building blocks" and connections being displayed as colour-coded shapes. Molecule is available now priced at $39. Find out more and download a demo at the Sinevibes website. Three crossover filters with -24 dB/octave slope. Multiple processing algorithms: comb filter, chorus ensemble, ring modulator, frequency shifter, barber-pole phaser, sample rate and bit depth reduction, analog drive, hard clip, circuit-bent filter, fold-back distortion, two wave transformers. Three modulation generators with 8 different waveforms, per-cycle chaos function and lag switch. Eight full parameter snapshots for realtime switching and automation. Advanced transport sync algorithm with support for tempo and time signature automation.